What are the benefits of writing a chapter in an anthology? Plenty! The 80+ authors who have participated in Silver Tree Publishing anthologies, and especially the more than 15 authors who have participated in more than one anthology, have found great benefit in writing a chapter and having their name on the cover of a professional book. Here are some of their stories. Writing an anthology chapter gave me confidence as a business professional. “I always dreamed of writing, and I wanted to share my perspective with the world,” states Rusty Steele (Humans@Work). “The whole concept seemed too daunting a task; I didn’t know where to start and had so much self-doubt.” But participating in an anthology gave him new-found confidence. Writing a chapter gave me the platform to speak. Writing in an anthology has allowed me to begin and/or grow my business as a consultant, or helped me create a career path for that role for the future. “Not only did Cathy Fyock do a good job coaching us through the process, but her advice on how to use the book as a tool for obtaining business, getting speaking opportunities, and building self-esteem was invaluable,” adds Betty McHale (What’s Next in Human Resources). Being a part of an anthology with other like-minded authors expanded my professional community. Cynthia Schuler (Cultivating Culture) shares, “This was an incredibly rewarding experience writing with talented authors across multiple industries.” “Not only did I gain the experience and confidence to become an author; Cathy does an incredible job of connecting the authors during this process allowing a team of us to collaborate and start working together to help organizations in creating healthy cultures” adds Dawn Cacciotti. Dawn and several of her cohorts meet regularly and have shared speaking opportunities. Writing has helped me in establishing my credibility as a thought-leader. Being a part of an anthology is better than a resume. For those in job transition, being a book contributor demonstrates what positive action was achieved while unemployed, and provides documentation of the individual’s thought-leadership and expertise. Working with a writing coach helped me improve my writing and communication skills. “Thankfully that is where Cathy came in; she has a gift for helping writers get past their self-doubt, she doesn’t just coach you on how to write, she coaches you on how to write through the emotional hurdles that you will face along the way” suggests author Rusty Steele (Humans@Work). Having a book with my name on the cover has given me a new income stream. Writing one chapter for an anthology gave me the knowledge and confidence to write my own book. 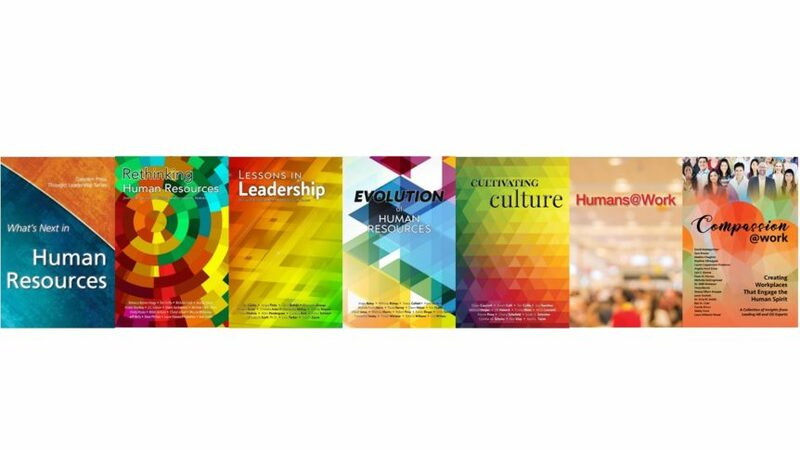 Authors Elizabeth George (Lessons in Leadership) and Rebecca Barnes-Hogg (Rethinking Human Resources) have each benefited from writing a chapter in an anthology, and have gone on to write their own solo books. Elizabeth is the author of True South, and Rebecca has just recently published The YOLO Principle. “Being part of the anthology series, Lessons in Leadership, was an invaluable experience, and helped me build confidence as a writer and gave me the courage to move forward with writing my own book,” says Elizabeth. Being a published author has allowed me to realize a life-long goal! You can also read more about anthologies in these two articles in Speaker magazine, authored by Compassion@Work authors Stacey Oliver-Knappe and Tonia Morris.